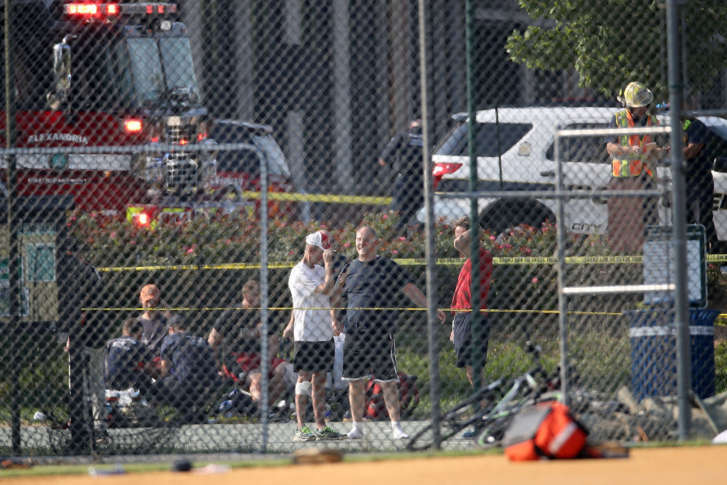 Representatives and senators who were at the Congressional Baseball Game practice in Alexandria during the shooting Wednesday morning describe a scene reminiscent of combat and say that the leadership position of one of the players may have been what saved their lives. WASHINGTON — Representatives and senators who were at the Congressional Baseball Game practice in Alexandria during the shooting Wednesday morning describe a scene reminiscent of combat and say that the leadership position of one of the players may have been what saved their lives. In interviews with various media outlets, some members of Congress described being pinned down in a dugout and behind a batting cage, while Rep. Steve Scalise, R-La., the House majority whip, lay wounded near second base. At one point, a senator wasn’t sure whether the shots coming from the opposite direction were fired by the Capitol Police or whether they were surrounded by shooters. The Republican team was taking batting practice at Eugene Simpson Stadium Park at about 7 a.m. Wednesday. Sen. Jeff Flake, R-Arizona, said that a photographer at the practice saw someone behind the third-base dugout raise a rifle. The photographer “said he thought ‘Why in the world is somebody bird-hunting out here at this time?’” Flake said. Flake and many members of the team ran into the third-base dugout, a cinder-block structure with a connection to the fence that offered some protection. Barton’s 10-year-old son was with them. “We got him into the dugout and stuffed him under the bench,” Flake said. Rep. Mo Brooks, R-Ala., told CNN that he was on the third-base side of home plate when the shooting started. “I see the shooter, he’s probably about 80 or 90 feet away from me … and I figure out if I can see him, he can see me.” He ran behind the first-base side of the batting cage, which had a blue plastic barrier around it and hit the dirt. “It’s about a foot or two drop into the ground, so you at least have some cover,” Brooks said. Meanwhile, several people had been hit. According to various accounts, Hodgkinson had two guns and reloaded a few times. One of the wounded made it into the dugout, while Scalise lay between first and second base, shot in the hip. Flake added that the gunman eventually moved behind the backstop behind home plate — where Brooks and a few other players had been. Both officers, David Bailey and Crystal Greiner, were hurt in the exchange of gunfire with Hodgkinson. “It was rather startling, as you can imagine, to look up and there’s a pistol being fired about five feet from your head. And the joy I felt, knowing it was one of our guys — I’ll never forget that guy,” Brooks said. It took about several minutes for the Capitol Police and the Alexandria police to take Hodgkinson down, but for the people hiding from the shots it seemed to take forever. In the meantime, Scalise was still lying wounded on the field. Rep. Brad Wenstrup, R-Ohio, a former Army surgeon, went out with Flake to Scalise, he said. “Steve was conscious and OK,” Wenstrup said. Wenstrup “asked me to apply pressure to the wound, and I did that” while Wenstrup worked on cutting away Scalise’s baseball pants, Brooks said. From there, a wounded Capitol Police officer, presumably Bailey, stuck to his job.